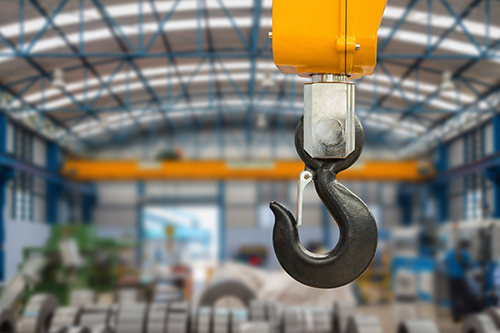 There are numerous types of hoists out there and selecting the right one can be a daunting task. Answering these 10 questions will help you choose the best hoist for your specific application. 1. What are the needs of your specific application? Detailing what you are trying to achieve will help determine the best hoist solution. 2. Is the load staying in one area or does it need to travel? the hoist and its load horizontally. 3. What is the number of hoist motor starts per hour? Duty cycles vary, from infrequent (H1) to high volume (H4) or even continuous use per hour (H5).The most common hoist problems arise when they are used beyond their intended duty cycle rating. 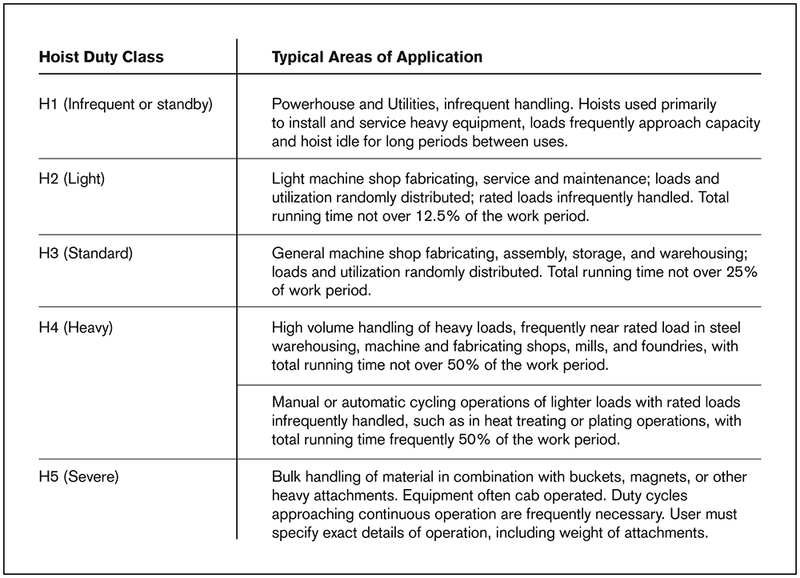 See the chart below for an explanation of Hoist Duty Service Classifications. 4. What are the maximum weight requirements of your application? How much are you trying to lift? Include the weight of the lifting plus any lifting devices. 5. Is lift speed important? 6. What is the amount of lift? Finding your lift number is easy: for example, if the item is 3 feet up on a conveyor, and your hoist is 20 feet up, your lift is 17 feet. 7. What is your maximum headroom? Headroom size and obstacles are factors in choosing a hoist that will fit your space. 8. What will be the power supply? Choosing the wrong voltage can fry your new hoist. 9. Is your hoist application located in a hazardous environment? If the hoist will be used around flammable gases or fumes such as in a paint shop, spark resistant features in a hoist are vital. 10. Who can help me select, inspect and maintain my hoists? Funny you should ask— Sharrow Lifting Products has the experience and expertise to help you get the best hoist for your specific application. We also provide hoist inspection and repair services. Sharrow specializes in both electric and manual hoists. Using your specifications, we’ll get you the correct hoist to meet your load and application requirements. We can also provide you everything from an entire crane system to the smallest of rigging components and anything in between, Sharrow knows lifting and we will work with you to make sure you get the right products for your application. Our training, service and inspection services can keep you up and running. The following chart is provided to give the reader an idea of the relative significance of the duty cycle ratings for the various electric hoists. The duty cycle determination for a particular application involves obtaining a significant amount of additional information and expertly applying it to the intended use. Please consult our application experts before making any duty cycle decisions. This table is given for reference only. Do not rely upon it for your application.